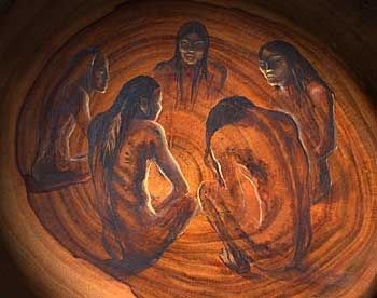 Shamanic circles for brothers, fathers, grandfathers…MEN! Years of experience with the various shamanic practices from the rainforest give me the opportunity to offer you this magical weekend. After this weekend you will have extensively become acquainted with the spirit of nature through various shamanic rituals that will guide you on your path. This medicine mindset is aiming at people who clearly want to make a big step for themselves. We are offered various moments in our lives as 'big turning points'. It is not always easy to go all the way in these moments. The fear of letting go of the familiar and daring to jump. In this we can guide you to become your greatest potential and let your light shine like never before. The whole weekend there will be eaten according to the shamanic diet from the rainforest. In preparation for this weekend you should start this diet at least 4 days in advance. You arrive Saturday morning and build the sweat lodge together with us. You connect with the elements by making a big fire. you learn to communicate with the fire . Before we enter the hut we hold a purifying water ceremony with a flower bath. At the white arrow a sweat lodge is not just a sweat lodge, it includes much more , it is a total experience with a lot of depth. No transformation has any value if you do not put them down here on earth, in your body, in matter ... the decisiveness! We can feel a lot of potential in life, which makes us eagerly look forward to what can ever come ... but no one can estimate the fear of the growing pains during this process. Feeling the voids during the release of something that is deeply rooted in your whole being. Patterns that are sewn into each cell of your body like blueprints ... to release them, each of us goes through an intense process. We will gladly accompany you on this road through the sweat lodge and the sound experiences. The sweat lodge brings you to your points of work or pitfalls in a very purposeful way. The insight is instant, you can immediately share it and give the ballast to mother earth.Space is being made in you to receive the new. From the secure feeling of being together in the sweat lodge, we get the feeling that everything is possible and that it will finally all become as we wish. Energy is released, themes are touched, openings are made, now you can really get started. That's why we also work a lot with sounds and spiritsongs from the rainforest during the hut. The sounds bring you further on your path, deeper in your process and gradually open more and more your heart, revealing your true potential. Building the sweat lodge together and lighting the fire already makes the first connection. The fire has a special healing effect on our body and mind. A few hours at a large fire our liver is completely lost, it also gives a strong focus on your inner strength and brings you into unity with yourself. You learn to feel the element of fire in you. Before entering a sweat lodge, the participants are energetically cleaned (smudge), with sage, for example. During the work with the shamans in Peru we noticed that the most adequate way to do this was via a flower bath. Together with the participants, we collect beautiful flowers, herbs and plants on the spot where we are and put them in a large pot of water. Here, extra beneficial essences are added. With this water you will be rinsed off before entering the hut. So that any loads that you take with you from your job, loads that you take with you from your job, family, traffic, stress, may already be thrown before entering the cabin. In preparation for the nightly work we start a profound breathwork. Transforming breathing or Rebirthing is given a new look. Our years of experience with sound healing, healing sounds and bodywork has created this unique way of rebirthing. We apply our skills in terms of sound during your profound breathing work. The accompaniment with various instruments from all over the world, ancient icaros and spirit songs, make your experience even deeper and more grounded. The shamanic nightly ceremony starts at 8 pm. The icing on the cake! This is where all the preparatory work comes together and we work all night on your themes and those of the group. We work with the energy of the rainforest, through hymns and music. The night is the perfect atmosphere to go deep, through our half / sleep. During this ceremony, you experience intense sound healing. We work here with all kinds of instruments, carefully and intuitively chosen in the moment to guide the group as precisely as possible on the journey inside. The energy of the icaros (spiritsongs from the rainforest) will take you to your depths and heights to gather all information about yourself that is important at this moment. Deep in the night there is also room for a healing round where we work together with you in co-creation around your personal theme. We close this intense retreat with a trip to the Andes mountains. I introduce you to the spirits of the mountains and the wisdom of the Queros. Together we will connect with the grandfather of the plant spirits. This will work with the firepower in us. Our masculine power to stand, carry, act, speak ... as warriors of light. We start this ceremony in the morning around 10 am. We will connect with the elements and also make a despacho together. A special ritual from the Andes where we make an offering, in which we can release all that is unnecessary that we have manifested in our lives. Letting go was the message all weekend long ... from the physical purification in the sweat lodge to the physical healing Saturday night to the profound spiritual healing on Sunday. A powerful series of rituals and ceremonies that will bring you back to your male potential. Seeing, feeling, experiencing and accepting your primal force ... brothers among each other.